M3C Because God is ... God Sees Me As He Sees Jesus | GOD Who Are You? AND Who Am I? Sometime after breaking up with her boyfriend, Marie attended church again. That day, she met the man who would become her husband. They spent much time together talking about God and their past lives, and joined a Bible study and began praying together. But Marie still did not feel much comfort and was depressed all the time. Over the next couple of months, Marie found herself driving by the lay counselor’s house- -the one to whom she had talked previously. She yearned for someone to talk to. Feeling like nothing was going right and needing direction, Marie thought she would just drive by the house; her car quit working. With no other option, she knocked. The lady was home, gave her a big hug and welcomed her into her house. Their talk was just the encouragement Marie needed. In the doldrums again one week later, Marie drove by the same house. Ironically, her car broke down again. This time, the counselor’s roommate was home. Carolyn was closer to Marie’s age. They decided to get together every week to talk. One month later, Carolyn asked, “How do you know Jesus loves you?” Marie could not answer her. “That’s absurd! I’ve been reading my Bible, going to church and praying for over a year now. What do you mean I don’t know Jesus? I walked the aisle.” Marie was so upset that Carolyn would think she was not a Christian. Eventually, Marie chose to face her life and give it to God. She prayed fervently from her heart. This time, as she confessed her sins before God, she could see angels fighting above her. She realized the devil had his hand on her and did not want to let her go. She could see the hand of God reaching down for her to go to Him, and she did. She opened her heart’s door to Him, and He came in just as He promised to do: “Behold I stand at the door and knock; if any one hears and listens to and heeds My voice and opens the door, I will come in to him and will eat with him, and he [shall eat] with Me” (Rev. 3:20 Amplified). What happened to Marie this time that did not happen before? What happens when Jesus comes in and replaces a stony heart with a soft one “that is God-willed, not self-willed” (Ezek.36:26)? What is the mystery at the heart of Jehovah Tsidkenu, the Lord our Righteousness, and this New Covenant? Understanding this transformation will make a tremendous difference in how we see ourselves–that God sees us just as He sees Jesus. 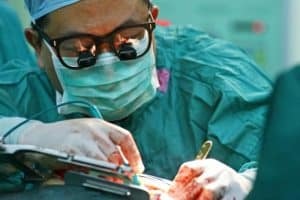 Comparing the operation Jesus performs on our heart, step-by-step, to a medical open heart surgery conducted over 200,000 times each year, called Coronary Artery Bypass Grafting (CABG), will give us some clues. Coronary Artery Disease is the leading cause of mortality in the United States. 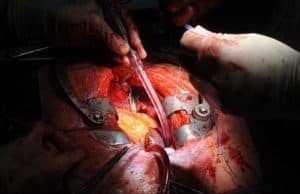 More than two in every five Americans die of cardiovascular disease, or hardening of the arteries.9 The CABG surgery creates a new route (bypass) for the blood supply to flow around the blockages, restoring blood supply to the heart itself so it can keep up with its demands. A patient has to trust a surgeon. She will be put to sleep with anesthesia, not knowing the outcome. She places her life completely in the surgeon’s hands, trusting in his wisdom to do what is right, in his power and ability to carry it out, and in his goodness and care as a fellow human being with her best interests at heart. Marie could now say she was a disciple of Jesus who knew where she had come from and where she was going. She knew heaven was her home because “anyone who believes in the Son of God has this testimony in his heart” (1 John 5:10). Not only did Jesus promise Marie a prepared place in heaven, but at the same time, He promised He would personally come back for her. For eternity, she will be where Love is. A typical CABG operation begins with a vertical opening in the front of the chest. The sternum (breastbone) is cut with a special reciprocating (jig) saw. The split sternum is spread open with a winch, and the pericardium (lining around the heart) is divided. Two tubes are then connected to the heart by cutting an opening. One tube siphons the blue (appearing through the skin), oxygen-depleted blood from the upper heart chamber by gravity into a reservoir. It is pumped through an artificial lung where it is exposed to oxygen. Now the blood is bright red in color. Finally, the heart-lung machine pumps the oxygenated blood back into the patient through another tube connected to the heart. The loop continues as blue blood, containing waste matter and carbon dioxide, goes into the machine, and red oxygenated blood returns to the heart. The sign of the covenant in the Old Testament involved cutting where blood flowed. When the members of the synagogue heard this they were furious. The American Standard Version of the Bible says, “. . . they were cut to the heart, and they gnashed on him with their teeth” (Acts 7:54b). But Stephen, full of the Holy Spirit, looked up to heaven and saw the glory of God, and Jesus. “Look,” he said, “I see heaven open and the Son of Man standing at the right hand of God” (Acts 7:55-56). At this they covered their ears, and yelling at the top of their voices, they rushed at him, dragged him outside the city and stoned him to death. The results of being cut to the heart in this incident were not good. The cutting revelation which the Holy Spirit brings always reveals truth. The people did not like what they heard, so, they rebelled, and destroyed what they thought was the source of their conviction. Moses wrote years before, “Circumcise therefore the foreskin of your heart, and be no more stiffnecked” (Deut. 10:16 KJV). Marie had to choose against her pride, stubbornness and rebellion in order to be obedient and open her heart to God. She knew she had built a tough wall around her heart she wanted no one to penetrate. In other words, she was resisting the Holy Spirit’s convicting tug at her heart. Thankfully, at the “do or die” point in her life, she chose life. The Holy Spirit was also tugging on Marie’s heart to go to church. Could the reason be: keeping the Sabbath day holy is another sign of the covenant? The Lord said to Moses, “Say to the Israelites, ‘You must observe my Sabbaths. This will be a sign between me and you for the generations to come, so you may know that I am the Lord, who makes you holy’ . . . observe the Sabbath, celebrating it for the generations to come as a lasting covenant” (Exod. 31:13, 16).